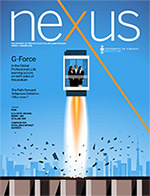 The Spring/Summer 2018 issue of Nexus features "G-Force: In the Global Professional LLM, learning occurs on both sides of the podium"
The Faculty of Law was pleased to revive the Consumer and Commercial Law Workshop in April 2018. Thank you to all of our generous donors who have given to the Campaign for Excellence without Barriers! New York City-based Alécia Chen and Kat Park are volunteering their time, and using some Maple Leaf moxie, to connect Faculty of Law graduates. Allied REIT’s founder and CEO loves to talk--about technology, strategy and so much more, in this conversation with Nexus editor, Lucianna Ciccocioppo.